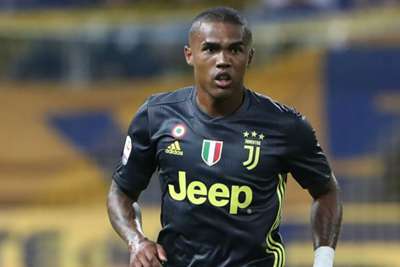 Massimiliano Allegri confirmed Juventus winger Douglas Costa has paid a fine for spitting at Sassuolo's Federico Di Francesco and asked the media to move on from the incident. Towards the end of Juve's 2-1 win in their last Serie A fixture, Costa and Di Francesco clashed, the Brazilian headbutting and elbowing his opponent, before then also spitting in his face. Costa was served with a four-match ban by the Serie A authorities and has been widely condemned, with Allegri among those to criticise him. Allegri said in the aftermath that Costa was to be fined by Juve, on top of the punishment handed down by Serie A. Now Allegri just wants to move on, with Costa paying for his actions. Speaking to reporters at a news conference on Saturday, Allegri said: "With regards to Douglas Costa, he's paid the fine and he's understood what he's done. "What's more, he is also now injured. It is all behind us, so let's move on from the episode against Sassuolo. No more talking about Sassuolo." In the eyes of some, Paulo Dybala has been the player most impacted by Cristiano Ronaldo's pre-season arrival, with the Argentina international starting just two of their four league games so far. But the 24-year-old will be returning to Juve's line-up when they travel to Frosinone on Sunday. "Dybala will start tomorrow [Sunday], I can confirm that," Allegri said. "He is an important player. "He's got goals in those legs and he can play as a centre-forward as well, though I would have to make some alterations if he did [play centre-forward]. "The team is improving in general and getting to know each other better. Ronaldo provides a wonderful added value for us, as his performances prove. "But the team doesn't depend on him. There are lofty expectations around Cristiano and he's also extremely demanding of himself, but he doesn't have anything to prove. "He just needs to play, enjoy himself and score goals. What happened on Wednesday [controversial red card against Valencia] is already behind us."